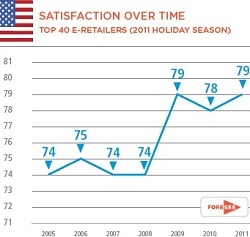 We already know that during the holidays online retailers had a big boost in traffic and sales (as reflected in November web brands report) and now there are also answers about the consumers satisfaction from those top online retailers in the holiday season. It seems that in general, the top online retailers managed to provide great shopping experience as the satisfaction is at its highest point ever (79), just like in 2009 after in 2010 it fell by one point. Amazon has established itself not only as the biggest online retailer but also as the best customer experience provider for the 14th time in a row (!) with a score of 88 (above 80 considered excellent). 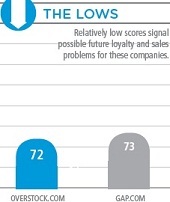 Later in line on the list with a score of 83 are Avon, JC Penney, QVC, Apple and Vistaprint. It is important to mention that no top 40 online retail company received a terrible score, however, Overstock (72) and Gap (73) received the lowest ones. Other companies that didn’t perform so well (again, relatively) are Buy.com and Sony with a score of 74. 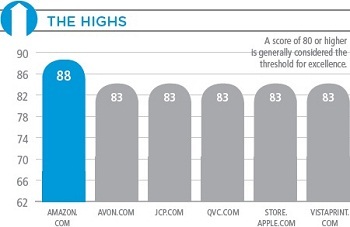 TigerDirect (+6 to 79), JC Penney (+5 to 83) and Dell (+4 to 80) had the biggest increase in satisfaction score. Other improved online retailers are Vistaprint, Home Depot and Macy’s with 3 point increase each. Netflix suffered from the biggest decline in satisfaction (-7 to 79). Gap (-5 to 73) and Overstock (-4 to 72) also had a sharp fall.